This was my first photo of Boston. Those eyes will haunt me forever. On the 10th of April 2007, I was advised that Boston was at a Sydney pound. Due to his poor condition, we had no idea how old he was, or how sick he was. Boston was emaciated, his skin was awful, and he had a huge gash/scar across his neck. We immediately told the pound we would take him. We argued with the pound, that he should be released prior to his mandatory impound period under 'duty of care' due to his shocking condition, but they refused. We visited him a few times whilst he was there, and were told he had been seen to by their vets, and he appeared to be doing well. 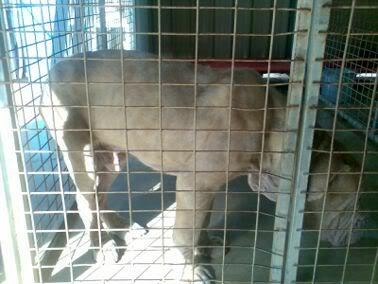 When the pound finally called to let us know we could take him, we asked he not be vaccinated, as his condition was so poor, vaccination on top of his issues, would be too much for his immune system - but they didn't listen and vaccinated him. Sadly - pound photos are all we'll ever have of this sweet boy. It is still through tears that I type this tribute page, so many years later. There is always one, that touches your heart so deeply, it is in honour of their memory that we keep doing what we do. I can't even begin to describe, how sweet and loving this boy was, despite the obvious abuse and neglect he sufferred at the hands of some other 'people' (and I use that term loosly). I went to the pound on his release day to meet up with his foster carers, Cindy & Elwyn, and take care of the paperwork, and found a dog who could barely walk. Below are extracts of 2 descriptions on what transpired on his release from the pound. PLEASE BE ADVISED: the below posts are quite distressing but it is important that his story is shared. Boston was only in our lives for just 11 days. But he will be remembered by all of us who were involved for the rest of our lives. 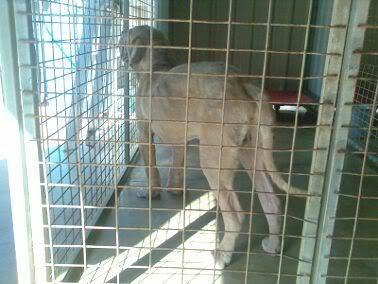 Leanne helped me in the days prior to Boston's release, visiting the pound and checking up on him. It is with a very sad heart that I post this today. 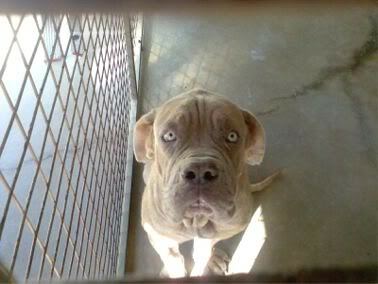 Boston died within 3 hours of getting him out of the pound and to a vet. When I saw Boston on Friday, I was disappointed in his condition. He was very lethargic and did not look well. I expressed my concern but was told he was very happy the day before and was probably just depressed. We were also told that he had a touch of kennel cough, but that was all. When Cindy collected him, she straight away knew there was something major wrong too. He could hardly walk and was wobbly. She rushed him off to the vet, who straight away said he was very sick. By the time they took his blood sugar levels, which were critical, he suffered a seizure. He was treated with antibiotics but before much else could be done, he suffered a massive hemorrhage. The vet said he was the sickest dog he had ever seen come into his vet and actually guessed his age as much older dogue, maybe even an adult due to teeth and tartar buildup. Boston was small and appeared so young. There are so many thoughts going through our minds at the moment. 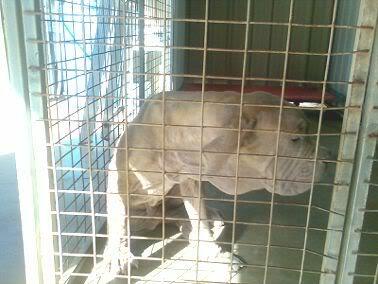 How could someone let an animal get into this state in the first place. That he was happy and looking well enough when we all saw him a week ago, and suddenly he was sick on Friday, then died on Saturday. I wish I had checked on him earlier and demanded a vet check. How could he have gone downhill seemingly unnoticed? The poor little man had a chance. I am so sorry for Cindy and Elwyn who had to bear the heartbreak of seeing his last sad moments. But commend them for their love of animals to want to take Boston into their home. It is very hard for me, Jo and Cindy as we got to meet him. I wish we had have got to him sooner. Be peaceful little man, you are in a better place now. Cindy and Elwyn picked Boston up to foster for us. They are the angels that gave him all the love they could in the couple of hours he was with them. I really do not know where to start. I'm settled with a glass of wine trying to make sense of the madness and futility of today. I've spoken to Jo and Leanne quite a few times today as everything unfolded and thought maybe it might help to post the full events of today and what I actually saw maybe for future reference when we see sick dogs? Not sure if that makes sense but there were a number of "red flags" as soon as we saw Boston this morning that might help someone else in the future. Although in saying that I think Blind Freddy could have seen how sick this poor boy was. We arrived this morning and went with the staff down to Boston's kennel to collect him and he was curled up in a ball on his bed. He stood and straight away my heart sank. He was unsteady on his feet and did not seem to have the strength to hold his head up. Elwyn went in with a lead to walk him out and as he walked his gait was very wonky although he really wanted to get out! I rang our vet from the car and told him we had a dog coming in as an emergency and could he please stay open if we did not make it before he closed. When we arrived at the clinic, Hugh (our vet) looked at Boston who was being carried in by Elwyn. He was limp and lifeless by this stage. As we carried him in he lost control of his bowels which was another real worry for us. He immediately took obs. One of those, the blood sugar level showed 0.9 which is a critical reading. We struggled to find a vein in his leg to draw blood for pathology. After we had blood and had some observations an IV line was put in and Boston got a dose of antibiotics. He was then transferred to the kennel area and placed on fluids. As we laid him in the kennel he started convulsing from a seizure and vomited. Again he lost control of his bowels. I tidied him up again and made him comfortable. I planned to take Elwyn home and then return back down to the clinic to sit with him for a while. As we drove home we got a call to say that 10 minutes after we left Boston coughed and suffered a massive hemorrhage. I hope I have not distressed anyone with the details. I just want to put it out there for future knowledge and so we have a record somewhere as a reference. So many thoughts go through my head including an incredible sense of guilt and wishing that we had got him out on Wednesday as we initially planned. More details will come to me later but my head is still reeling from today. Even though we have been fostering for years now it is still hard to not make a connection and feel this incredible sense of loss with a gorgeous boy you have only known for such a short time. The whole trip in the car he had my hand against him and I hope he died knowing a sense of love and caring. The saddest part was his eyes seemed happier out of the pound and I thought even though he was sick that the love and care would pull him through. We've lit a candle in his memory and our guys are inside with us sharing cuddles. I saw the vet this morning and he confirmed that Boston died of a severe infection which would have been treatable if it had been diagnosed earlier. He said that a normal dog would have a white cell count of 13,000 and Boston's was ~ 500 which was disgustingly low and something which shocked him. His lungs showed signs that pneumonia may have been present. From all of us that met you, or who followed your story that week, and in the weeks after, RIP Boston. You didn't deserve what happened to you. Your memory will never be forgotten, and we have saved and helped so many dogs after you, and I continue to do that in honour of your memory.